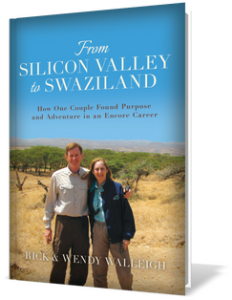 Rick and Wendy Walleigh, who live south of San Francisco, are former corporate executives from Silicon Valley technology firms. Wanting to have greater, more satisfying, impact on the world, Rick and Wendy each decided separately and in different years to seek an encore career or “next chapter” by switching to nonprofit organizations. Wendy made her transition first, becoming a marketing and fundraising executive at Junior Achievement in Silicon Valley in 2002. Her new role attracted her because it fit three of her top four areas of passion: education, entrepreneurship, and youth. Rick started later and took a different approach to determine his new direction. After many months of research and networking, he decided to pursue international economic development in a business-oriented organization. In late 2005, Rick talked to Wendy about volunteering / working abroad in international development. Wendy had envisioned living abroad many times in a city such as Paris, London, Hong Kong or Rio, but realized the focus now would be on developing countries. Since neither Rick nor Wendy was fluent in another language, it meant their destination had to be English-speaking. Wendy agreed to the idea of living in a developing country but she mandated that the location had to meet four key criteria: 1) no “stans” in the country’s name; 2) no flying bullets in the country; 3) hot showers in the living quarters; and 4) flush toilets in the living and working places. Before committing to an organization and an extended move to another country Rick volunteered in three projects that allowed him to experience a sample of the types of work that they might pursue together. In the first, he spent two weeks in Ayacucho, Peru as part of Care Corps. He found the work pleasant but less than satisfying because he did not use his many years of business skills and experience. In project number two, Rick helped friends who wanted to develop a mini-hydro-electric project in Soloban, a remote village in Nepal. Rick and the friends’ son flew to Kathmandu to discuss technical project details with the prospective engineering firm before traveling to Soloban to assess the villagers’ commitment to the project. To reach Soloban, they flew to Lukla, Nepal (the starting point for Everest expeditions) and then trekked 2 days. They were greeted enthusiastically by the villagers, and in a town meeting, it was easy to see that everyone was ready, willing, and able to commit to the building, operating and maintenance of this project. Although the project would provide each home only 50 watts of electricity, it would be enough so that children could study without the fumes from kerosene lanterns. Rick’s third project was for TechnoServe and consisted of finishing up a project report started by another volunteer who had to leave for a new job. The report was an assessment of the economic opportunities in East Africa for producing anti-malarial medicines, spraying services and bed nets. By this time, Rick had been referred to TechnoServe multiple times because they focused on business solutions to poverty, and he had already met with some TechnoServe executives at their Washington, D.C. headquarters. Through this process, Rick had determined that TechnoServe would be a good organization to work with so he and Wendy decided to become volunteer consultants as soon as she could conclude a major event at Junior Achievement. In retrospect, Rick’s exploration began a pattern that both Walleighs would develop over the next few years as they continued in their next chapters. They both would learn about subjects, people, and places about which they knew nothing, but through application of business and education backgrounds, they would become semi-experts. Rick and Wendy’s encore careers definitely leveraged all their strengths, experiences, and business and life skills while providing incredible opportunities to educate themselves and others. They also had fun exploring new cultures and countries. PLEASE VISIT WWW.TECHNOSERVE.ORG TO LEARN MORE ABOUT THIS AMAZING ORGANIZATION’S IMPACT IN LATIN AMERICA, AFRICA, AND NOW INDIA. By June 1, 2006, Wendy had resigned from Junior Achievement so Rick had told the TechnoServe VolCon Program Manager that they were ready. The Walleighs arranged for house-sitters, notified family and friends, packed four huge suitcases, and boarded a plane with two heavy carry-ons including laptops. On July 13, 2006, they moved into a cottage at Emafini near Mbabane, Swaziland. 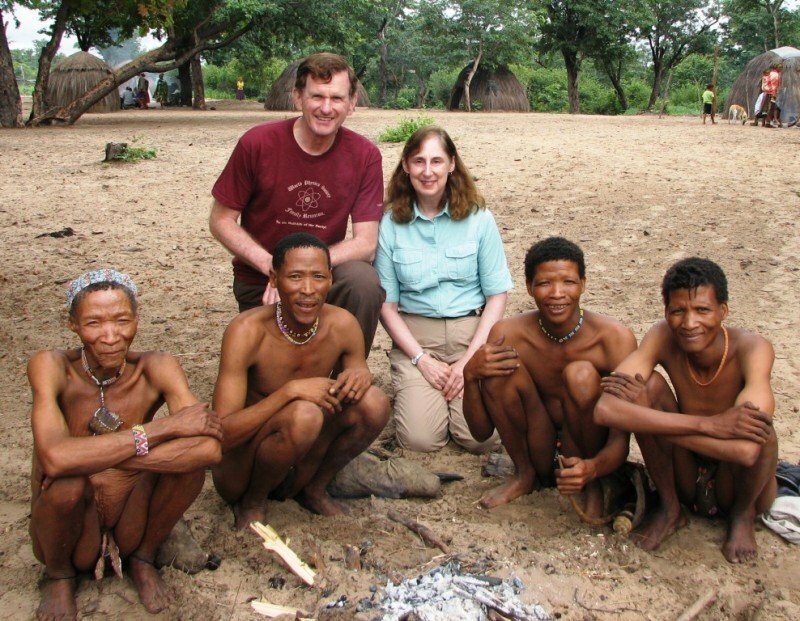 This website documents their international experiences as well as U.S. travels since 2006, beginning with six months in Mbabane, Swaziland. As the Walleighs’ Swaziland experience with TechnoServe drew to a close, they realized that it had just whetted their appetite for living and working in Africa. So Rick and Wendy signed on to live and work for TechnoServe in Nairobi, Kenya for the following year. While living there, their amazing travels and adventures included Uganda, Ethiopia, Zanzibar, Rwanda and all over Kenya. As important as enjoying their website’s photos, brief descriptions and longer travel journals, please read about and see the people they met in Africa and Latin America who have taken initiative on their own or when offered by TechnoServe to improve themselves, their families and their communities. They are truly what give the Walleighs hope for a better world and future. What are Rick and Wendy Doing Now? Since returning to California at the end of 2007, the Walleighs continue to regularly visit the U.S. east coast to see family and friends. They also travel internationally on average once a year, namely to Latin America, Turkey, Greece, New Zealand, Australia, and back to Africa. Rick and Wendy have now visited approximately 55 countries on six out of the world’s seven continents plus many islands in between, as well as swum in the Indian, Pacific, Atlantic Oceans and Caribbean and Mediterranean Seas. Also included on the website are Wendy’s father’s pictures from World War II when he was stationed at military bases and flew cargo planes across sub-Saharan and northern Africa. When not traveling somewhere or skiing or backpacking, Rick works half-time for TechnoServe*—mostly from California and occasionally in Washington, D.C.—as a Senior Advisor on many operational issues to support the organization’s dramatic growth. Wendy continues to be involved in Junior Achievement as an Advisory Board Member of JA of Silicon Valley. She occasionally does projects for TechnoServe and marketing work for local small businesses. They consider themselves “commercially retired” but for the foreseeable future will actively contribute their time and skills to their next chapter’s ongoing work, which will be documented on this website. Rick and Wendy’s trips to the east coast are often to see their adult son and daughter. Their son is an attorney for the State of Massachusetts and previously worked in a tri-city legal aid organization. Their daughter is a pediatric neurologist at a leading children’s hospital in Philadelphia. *Rick’s career change was featured in a Wall Street Journal online article with an odd title: Second Acts: Career Paths for Worn-Out Executives.